You just don't feel right unless you're covered in fur. It's like something is missing. Because fur comes from your babies, those precious little people who walk around in their shaggy, fluffy, and curly coats. You're a Fur Mama! At your house, the fur is always flying. You've bought stock in lint rollers and your vacuum cleaner is permanently attached to your hip. Not that you mind; you love it because the more fur, the more furbabies you have. At least you don't have to worry about changing stinky diapers. 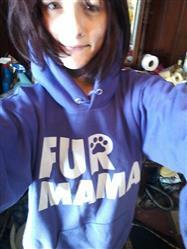 Keep rocking and rolling, Fur Mama, and wear this tee with fur or without. Great shirt for dog moms! Fits great! I have gotten several compliments already! The shirts are pre shrunk cotton so I don't have to worry about it shrinking.